Today was another payout day of diytube and I received the highest amount of steem I got so far from @diytube! 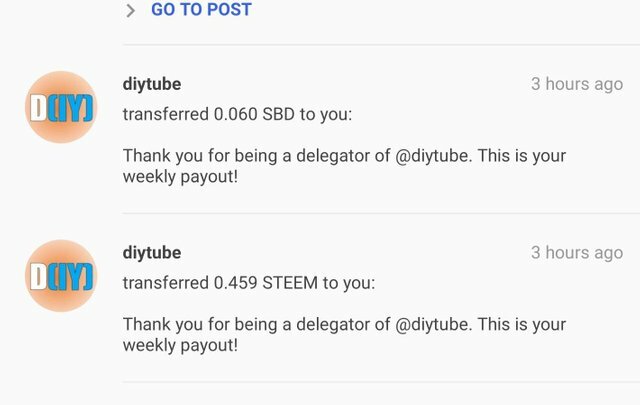 You can also generate passive steem/sbd income by delegating to diytube! More delegation leads to more payout for the delegators: BLING BLING! If I delegate a certain amount, I will receive payments for life (as long as Steem "lives")? That is super cool!! Thank you for your delegation!! Oh I saw you have 23SP yet. I would encourage you to collect some more before delegating to any project or dapp. You need yours for yourself at the current state of your journey here! It's about curation of good and valuable DIY content on DTube. Just check the channel @diytube our for more information! That sounds super cool :) Thank you in advanced for your delegation and thank you right now for your comment and resteem! Quite welcome. I'll see you on the flip side. @dlike also pays with STEEM/SBD to their delegators. Can I ask you how much did you delegate to @diytube? Ok this is cool . I have 2 question this will give weekly payout only ? And the return which we can see in snap shot is how much STEEM you delegate to it so you got this return ?? I delegate 1000SP and receive this 0.4 steem weekly. That depends on the voting of @diytube and the rewards of the voted posts etc etc. hi and nice stuff with diytube but i always have problems with the upload at dtube. hope in the future they will fix the problems.